Railpictures.ca - Stephen C. Host Photo: Running between Kent St 20 cylinders, EMD 645 powered ‘real’ SD45-T2 leads GEXR 431 in Guelph. Recent addition of fencing along the right of way in Guelph has me worried these shots will be ‘fenced in’ soon so I am making sure to get them off the list while I can. Further to this, 3054 is expected to be parked sometime this week once 3393 is back in service. As the saying goes, get your shots while you can – change is always just around the corner. Are there any real SD45′s in active service anywhere in Canada other than GEXR? Comments appreciated below, please and thank you. | Railpictures.ca – Canadian Railway Photography – photographie ferroviaire Canadienne. 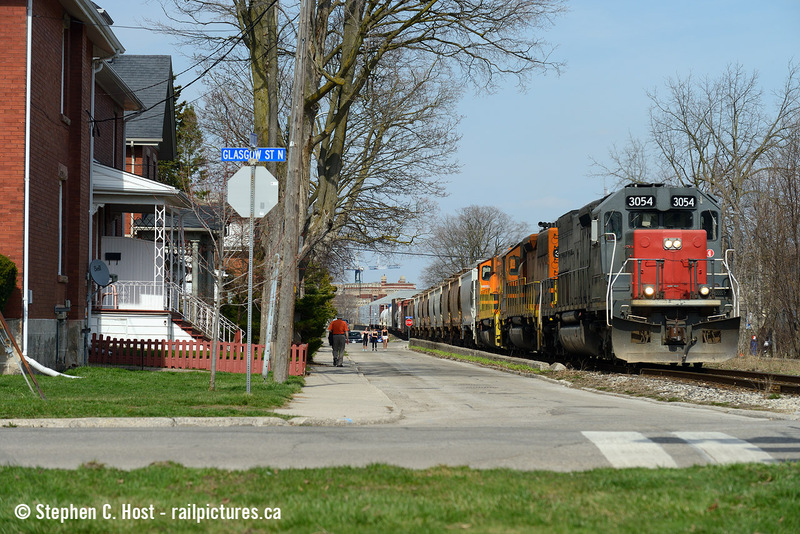 Caption: Running between Kent St 20 cylinders, EMD 645 powered 'real' SD45-T2 leads GEXR 431 in Guelph. Recent addition of fencing along the right of way in Guelph has me worried these shots will be 'fenced in' soon so I am making sure to get them off the list while I can. Further to this, 3054 is expected to be parked sometime this week once 3393 is back in service. As the saying goes, get your shots while you can - change is always just around the corner. Are there any real SD45's in active service anywhere in Canada other than GEXR? Comments appreciated below, please and thank you. Well you can consider CN SD40T-3s (which used to be SD45T-2s) but those are rare and are usually in service in the DMIR. but if you mean the real deal ’45s, I do not know! No true SD45′s that I am aware of…some SD45 car bodies but internally a SD40 out West iirc. You’ll have to go down to the BPRR for true SD45′s!! And even some of those have been overhauled and converted at Butler. Big fan of this one, Steve. Afraid I’m unaware of any other SD45s though.